Multiple studies have documented racial differences in graft survival in kidney transplant recipients. Although several studies in adult kidney transplant recipients have evaluated risk factors that might predispose to these differences, studies in pediatric patients are lacking. This study retrospectively analyzed data from the North American Pediatric Renal Trials and Collaborative Studies (NAPRTCS) to identify racial differences in kidney transplant outcomes and evaluate factors that might contribute to those differences. The study was restricted to the first NAPRTCS registry–reported kidney transplant for pediatric patients (age ≤21 yr) whose race was reported as either black or white. Univariate graft survival analyses were performed using the log rank statistic. Relative hazard rates for the effect of race on graft failure were determined using proportional hazards models. Multivariate analyses were restricted to patients with >30 d of graft survival and were adjusted for initial diagnosis, donor source, presence of delayed graft function, era of transplantation, estimated GFR at 30 d after transplantation, and number of days hospitalized in the first month after transplantation. Graft survival was significantly lower in black transplant recipients at 3 yr (70.9 versus 83.3%) and 5 yr (59.9 versus 77.7%). After controlling for confounding factors, black recipients continued to have a higher risk for graft failure than white recipients (adjusted hazard rate 1.65; 95% confidence interval 1.46 to 1.86). Significant racial differences in kidney transplant outcomes exist among pediatric patients even after controlling for confounding factors. Transplantation remains the treatment of choice for ESRD in children. Racial disparities in transplant outcomes, including acute rejection and graft survival, have been clearly documented in both pediatric and adult kidney transplant patients. Recent studies have demonstrated improvements in rejection rates and short-term graft survival as a result of multiple factors, such as use of more potent immunosuppressive agents and better understanding of the rejection process (1–4). Despite the significant improvement in short-term outcomes in black patients, similar success in long-term graft survival has continued to elude adult and pediatric minorities. Even in living-donor (LD) and zero-mismatched transplants, long-term graft survival is significantly shorter in black adult patients (5–7). Although studies in adult kidney transplant patients have identified several factors that might contribute to the poorer long-term outcomes in black patients (8), few studies have attempted to elucidate these factors in pediatric patients. We therefore sought to use a large, national database of pediatric kidney transplant recipients to evaluate racial disparities in graft outcomes and identify factors that might contribute to those disparities. The pediatric renal transplant registry of the North American Pediatric Renal Trials and Collaborative Studies (NAPRTCS; formerly known as the North American Pediatric Renal Transplant Cooperative Study), in place since 1987, was used for this retrospective study. NAPRTCS is a voluntary, collaborative research effort of more than 140 pediatric centers in Canada, Mexico, and the United States that collects data on children who have chronic kidney disease and who are on dialysis and status after kidney transplantation. Participation in the NAPRTCS is approved by the institutional review board at each center. As of the 2006 Annual Report, the transplant registry of NAPRTCS contained data on 9837 kidney transplants that were performed in 8990 pediatric patients. The study was restricted to the first registry-reported transplant for pediatric patients whose race was reported as either black or white. Data studied included era of transplantation (1987 to 1995 versus 1996 to 2005), age at transplantation, gender, and cause of ESRD (renal hypoplasia/dysplasia/aplasia, obstructive uropathy, FSGS, reflux nephropathy, and other). These diagnostic categories are used because they represent the leading causes of ESRD in children. Other causes of ESRD, including chronic glomerulonephritis, account for <3.5% of patients who are enrolled in the transplant registry of NAPRTCS and are therefore evaluated together as “other.” Other variables that are included in the analyses are standardized height and body mass index (BMI), history of maintenance dialysis before transplantation and duration, previous transplant, transfusion history, donor age, donor source (deceased donor or LD), use of preoperative immunotherapy, HLA mismatches, including zero mismatches, and maintenance immunosuppression medication use in the first month. Because the interest is focused on longer term function, we restricted the analysis to those with 30 d of graft function. Additional data included presence of delayed graft function as defined by need for dialysis during the first week after transplantation, need for antihypertensive medication in first month after transplantation, rejection in the first month after transplantation, transplant month hospitalization days, and estimated GFR (eGFR) as calculated by the Schwartz formula (9) at 30 d after transplantation. Clinical and demographic characteristics were compared using the χ2 test or Wilcoxon two-sample test where appropriate. Tests were two-sided, with an α level of 0.05. Univariate graft survival analyses were performed using product-limit methods, and comparisons were made using the log-rank statistic. Relative hazard rates (HR) for the effect of race on graft failure were determined using proportional hazards models. Analyses were restricted to patients with >30 d of graft survival. A multivariate model was fit with all of the candidate defined predictors. A model with reduced size excluding nonsignificant variables was fit, the stability of the race parameter was examined, and the results were presented. The study population included 6287 patients with functioning grafts at 30 d after transplantation, 4956 (78.8%) of whom were white and 1331 (21.2%) of whom were black. Demographic and clinical characteristics for these patients at the time of transplantation are shown in Table 1. Black patients were more likely to have FSGS as a cause of ESRD. There were no differences in gender distribution or BMI, but black patients were older and taller on the standardized height scale. Transplant characteristics are listed in Table 2. Black patients were less likely to receive a graft from a living donor. Black patients were more likely to have a history of maintenance dialysis and have longer duration of maintenance dialysis before transplantation (data not shown). At 30 d after transplantation, black patients had higher rates of delayed graft function and lower mean eGFR and were more likely to be prescribed antihypertensive agents (Table 2). No racial difference in acute rejection at 30 d after transplantation was observed. Black children spent an additional day (15.9 versus 14.9; P < 0.001) in the hospital during the transplant month. Black patients were more likely than white patients to use mycophenolate mofetil and tacrolimus; the latter drug continued to be used more frequently in black patients in the more recent era. Although mean eGFR at 1 yr after transplantation was similar in black and white patients (75.55 [SE 0.99] versus 76.21 [SE 0.45]; P = 0.596), univariate survival analyses revealed that graft survival rates were significantly lower for black compared with white patients (P < 0.001) in both early and more recent transplant cohorts (Figure 1). Among those with 30 d of graft function, 76.9% of black patients had surviving grafts at 3 yr compared with 88.8% of white patients, and at 5 yr, 65.6% of black patients had surviving grafts versus 83.1% of white patients. The unadjusted hazard ratio shows that black patients had a 2.05-fold higher risk for graft failure. The results of multivariate analysis are shown in Table 3 and reveal that after controlling for multiple significant predictors of graft retention including age, cause of ESRD, preemptive transplantation, number of days hospitalized, rejection experience, and eGFR at 30 d after transplantation, black patients had a higher risk for graft failure than white patients with an adjusted HR 1.65 (95% confidence interval 1.46 to 1.86). Use of the full model with an additional 12 parameters including HLA-A and DR matching, body size, antihypertensive medication use, and era of transplantation did not change the race risk estimate, whereas the upper confidence interval limit increased only one unit in the second decimal place. Kaplan-Meier analysis of time to graft failure in patients with graft function >30 d after transplantation, by race. In studies of adult kidney transplant recipients, several factors have been identified as contributing to the reduced graft survival that is seen in black patients. These include immunologic factors, such as hyperimmune responsiveness and cytokine polymorphism, increased MHC polymorphisms that make matching more difficult, and variability in absorption and effect of immunosuppressive medications in black patients (8). In addition, nonimmunologic factors such as different causes of ESRD and increased incidence of hypertension play a role in inferior graft survival in black patients (8). 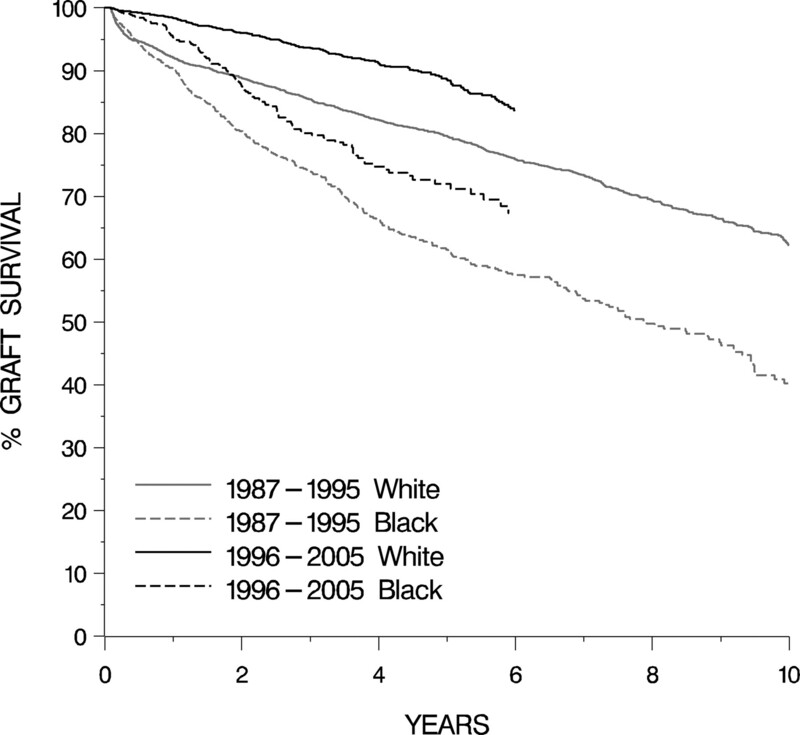 Although significant success has been achieved in improving these racial differences in short-term survival (1–4), unfortunately the same cannot be said for long-term graft survival. Efforts to improve long-term graft survival will be of added importance in the pediatric age group because linear growth and development are closely linked with graft function. Our study is one of the largest to evaluate racial difference in transplant outcomes in pediatric kidney transplant recipients and to identify factors that might predispose to poorer long-term outcomes. Our study confirms that although graft function is similar at 1 yr after transplantation, 3- and 5-yr graft survival is inferior in black patients. Using the large NAPRTCS database allowed multivariate analysis to evaluate the influence of race on graft outcome while controlling for confounding factors. As in adult studies, our analysis revealed that black patients were more likely to have several factors that are associated with poorer graft survival. Even after controlling for these factors, black patients had a significantly increased risk for graft loss. Studies in adult and pediatric kidney transplant patients (10–12) have identified black patients as having higher BP at both short- and long-term posttransplantation. The detrimental effect of hypertension on graft survival in adults, especially black, is widely known (13–15). Hypertension has also been implicated in the progression of chronic kidney disease to ESRD in both adult and pediatric studies (16,17). Our study does not identify the use of antihypertensive medications at 30 d after transplantation as a risk factor for graft failure. However, this classification may not have captured patients who had hypertension and were not on antihypertensive medications. In addition, the development of hypertension later in the transplant course was not detected with this classification. Nonadherence has been linked to poor long-term graft survival in adult transplant recipients (18,19). Adolescents have the highest rate of nonadherence after transplantation (20), with a resultant high rate of graft failure (21). In our cohort, black patients were closer to adolescent age at transplantation, making it feasible that adolescent nonadherence contributed to poorer long-term graft survival. It is interesting that in a study by Ishitani et al. (7) involving pediatric LD transplants, adolescents who were between the ages of 12 and 13 yr and initially started out with good graft survival eventually had worse graft outcome, but only 8% of graft losses in the adolescent years were attributed to nonadherence. The authors recognized, however, that nonadherence might have been underreported or not recognized (7). Unfortunately, objective data on nonadherence are not collected by the NAPRTCS. A recent study of the US Renal Data System demonstrated that higher education level of the recipient, resident citizenship, and private insurance all were associated with improved graft outcomes in kidney transplant recipients, regardless of race (22). Although pediatric patients were included in this analysis, it is unclear how their education level and citizenship were evaluated. Clearly, an in-depth study of children is required and would need to include parental education status, socioeconomic status, and citizenship. Although NAPRTCS collects data on parental education and insurance, these data have been collected only in more recent years of the registry. No data on socioeconomic status or citizenship are collected by the registry. Similar to adult studies that demonstrated improved short-term graft survival and acute rejection rates between races (21), 30-d posttransplantation acute rejection rates and 1-yr graft function were not significantly different between black and white patients in our cohort. These results are encouraging but, like the multivariate analysis, should encourage us to focus attention on long-term factors that may be affecting graft survival in black patients. Tailored prescription and monitoring of long-term immunosuppression to black patients and aggressive monitoring of chronic allograft nephropathy should be considered as efforts to improve long-term graft survival in black patients. In a large pediatric kidney transplant population, black patients had a significantly increased risk for long-term graft failure even after controlling for multiple confounding factors. More research should be applied to correcting the factors that result in poor graft survival in black pediatric kidney transplant recipients. This work was presented in part at the American Society of Pediatric Nephrology and Pediatric Academic Societies Annual Meeting; May 14 to 17, 2005; Washington, DC. A report from the North American Pediatric Renal Trials and Collaborative Studies (NAPRTCS) registry confirms that children have an inferior renal allograft failure rate than whites. A report in this month's JASN by Augustine et al. (pages http://jasn.asnjournals.org/cgi/content/abstract/18/5/1602 analyzes the presence of cross-reactive antidonor T cell immunity, which increases with longer durations of hemodialysis. This may provide an explanation for the observed relationship between increased dialysis exposure and transplant outcome, particulary in black kidney recipients.